1. AGREEMENT. PROPERTY OWNER (“Owner”) and Tenant hereby agree that Tenant will rent from Owner the property as specified above for and during the term set forth in reservation, on the terms and conditions set forth in reservation. 3. CANCELLATION. If you cancel this reservation, you will forfeit all sums paid, unless we are able to re-rent the Condo to someone else, at the same rate, for the same period. If the Condo is re-rented, we will refund the lesser of (1) all Rent paid by you or (2) all Rent paid by the new renter. 4. CHECK-IN. Check-in time is 4:00 PM. Early Check-in times are allowed only when the Condo is cleaned and ready for occupancy, and prior approval is required. Keys and parking passes will be ready for pickup from owner’s representative. Keys will not be issued with a balance owing or without a signed rental agreement in the Owner’s possession. 5. CHECK-OUT. Check-out time is 10:00 AM (a late checkout fee will be charged if a late checkout request is not approved). Please leave all keys in the lockbox. There are no refunds for early check-outs. 6. CLEANING. The Property will be cleaned before your arrival and after your departure. Daily cleaning service can be purchased separately. You are required to leave the Property in the same general condition in which you received it, by making sure dishes are done and put away, the beds are stripped and the Property is generally picked up and ready to be vacuumed, dusted and sanitized. 7. TELEPHONES. You must use a phone calling card or personal cell phone to make long-distance telephone calls from this Property. 8. WHAT WE SUPPLY. The Property is fully furnished and includes bedspreads, linens, blankets, pillows, towels, as well as a fully equipped kitchen and a washer and dryer. 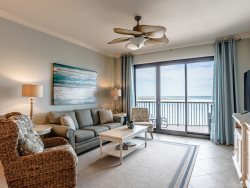 The Property is re-provisioned each year at the beginning of the rental season, however, we make no guaranty that all items will remain in the condo during your rental. Furniture, paint colors, accessories may be changed or upgraded from the pictures from time to time as well without notification. 9. WHAT YOU SHOULD BRING. You should bring your personal toiletry items, beach towels, food and any other consumables. j. Groups comprised of parties all under age of 25. 10. TENANT’S LIABILITY TO OWNER. In the event of any damage (other than normal wear and tear), loss or theft to any of Owner’s property during Tenant’s rental of the Condo, Tenant shall be liable to, and shall make immediate payment to, Owner for compensation for such damage, loss or theft. 11. OWNER’S RIGHT OF ENTRY AND RIGHT TO INSPECTION. Owner reserves the right to enter and inspect the property with no notice at any time during the Tenant’s rental term. 12. RELEASE AND INDEMNIFICATION. Tenant fully releases, and agrees to indemnify and hold harmless, the Owner and the Owner’s agents (Alabama Getaway LLC), representatives, principals, members, employees, officers, and directors, from and against any loss, damage or expense, including reasonable attorney’s fees, incurred or suffered by or threatened against the Owner or any of the foregoing in connection with or as a result of any claim for personal injury, property damage, property loss or theft or otherwise brought by or on behalf of Tenant, other occupants or invitees of Tenant or any third party, person, firm or corporation as a result of or related to or in connection with the Tenant’s rental of the Property. Owner cannot be responsible for any of the Tenant’s (or other occupants) valuables, cash, or personal property during the rental term or thereafter left at the rental property. 13. DAMAGE DEPOSIT. Tenant acknowledges that they will provide a separate check in the amount of $300.00 or $500.00 (depending on Property) to be retained by Owner as a Security Deposit. Tenant understands that the check will be returned via mail after Tenant’s rental term assuming no damages occurred during Tenant’s stay. This security deposit shall be sent with the tenant’s full payment of rental and all fees. By agreeing to these 'TERMS AND CONDITIONS', Tenant agrees to be financially responsible for all damages, theft, and excessive cleaning, as well as legal fees incurred by Owner, as a result of litigation to collect for damages. Please contact owner or owner’s rep if something is accidentally broken or if something is found to be missing so it can be replaced as soon as possible. The Security Deposit will not be returned if Tenant violates the pet policy. Tenant will be liable for an additional cleaning fee to remove smoke odors if smoking is allowed in the condo. a. This Agreement (including the documents referred to herein) constitutes the entire agreement between the parties and supersedes any prior understandings, agreements, or representations by or between the parties, written or oral, to the extent they related in any way to the subject matter hereof. This Agreement may be amended only by an express written agreement signed by Owner and Tenant. b. This Agreement shall be binding upon and inure to the benefit of the parties and their respective successors and assigns. Tenant may not assign this Agreement except on the express prior written consent by Owner. c. This Agreement shall be governed by and construed in accordance with the domestic laws of the State of Alabama without giving effect to any choice or conflict of law provision or rule. d. Tenant submits to the exclusive jurisdiction of the courts in Baldwin County, Alabama for the resolution of any disputes or other matters pertaining to or relating to this Agreement.